When I went along to see The Lady Boys of Bangkok I was given a little goody bag containing some nail wraps and nail varnishes from Bad Apple Cosmetics, who are sponsoring The Lady Boys. Today I thought I would show you the nail varnishes. A post of the nail wraps will follow later. The shades I received were Bad Bad, 3D Arlington and Barn and I also received a base and top coat (which I was very pleased about as my current base coat has seen better days and I’m currently using a top coat I have ’borrowed’ from my mum). Unfortunately when I took Bad Bad out of the goody bag I discovered that at some point it had leaked, which you can just see on the picture at the bottom of the cap. So this one is now a bit gungy around the lid and I’m not sure how to try and clean this off without getting into a big mess. 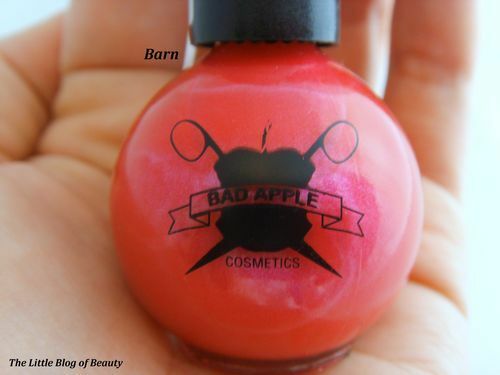 Bad Bad is just a simple clean dark black and Barn is what I would describe as a deep hot pink containing shimmer. 3D Arlington is the most difficult shade to try and describe. 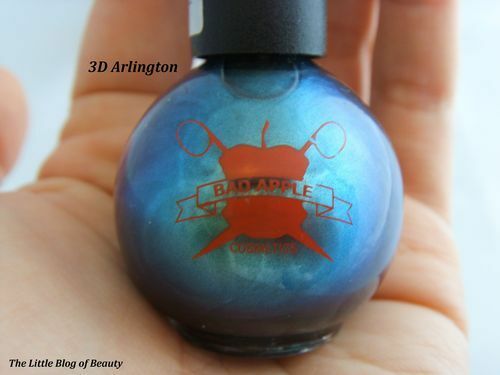 Bad Apple describe this as a 3D shade (because the colour changes as you move your hand) which contains an infusion of gold flake, silver and a hint of emerald. I would describe it as a shimmering emerald/moss green shade kind of shade. I don’t currently own any black nail varnishes; although I like black clothing I find black on my nails a bit dark. To be honest I’m not sure that I would use this unless maybe if I was going to use it for nail art or for a look for a shoot. I’m also not a fan of green nail varnishes but this is a very interesting shade and I think I might give it a try in the winter. My favourite shade is definitely Barn which I think will look great in the summer when the sun shines on it. 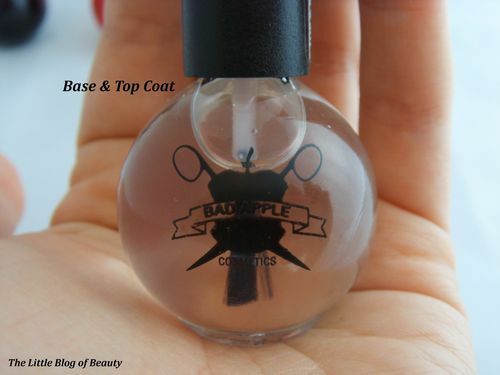 I have only actually tried Barn on my nails but I found this easy to apply, quick drying and pretty hard wearing. I also have this on my toe nails and I know varnish will last longer on your toe nails than your finger nails but I have had this on for a couple of weeks now and it’s still looking good. In terms of the actual bottles, considering these are just under £10 each, I have to be honest and say I’m not that impressed by them. They just don’t look very good quality and the logos aren’t very well printed with small parts missing on each bottle. As I said Bad Bad had also leaked by the time I received this. 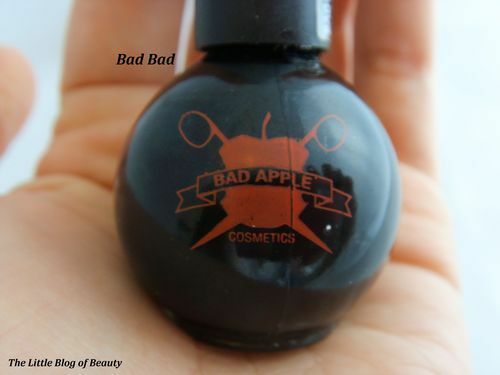 I took a look at the Bad Apple website (which you can find here) and found that this is also not very well presented. There are several links across the top of the page but the majority of these pages have nothing on them. When you click on one of the nail varnishes to take a closer look there is some information about the varnishes and the particular shade you are looking at but on several shades there is also a sentence about the shade Green Bramley. Also on several shades there is an RRP price and an our price but they are both the same and you’re told that you’re saving £0.00. I could maybe understand a website like this if the brand was new but the bottom of the page indicates that they may have been going since 2008. I think I would be reluctant to spend £9.95 on a nail varnish from a website like this. That aside, as I have said I do like the actual nail varnishes, I’m just not as keen on the bottles and the brands website.